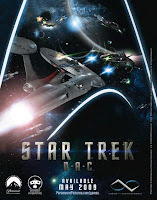 TrekMovie.com have received some details on the enigmatic new movie tie-in game Star Trek D.A.C. ; The game will be a top-down arcade starship combat affair, to be available first on X-Box Live Arcade and later on the Playstation Network. There will be single and multiplayer, with a focus on multiplayer. There will be two sides, Federation or Romulans, with three types of ship for each; flagship (Enterprise, or something inspired by the Narada), fighter & bomber, which are inspired by designs in the film. The game will feature sound and music from the film.